Many horse owners are finding it increasingly challenging to find and purchase suitable hay at a price they can afford. Low hay yields due to dry weather in 2012 were followed by poorer quality as a result of rainy haying weather in 2013. However, there are also long term economic factors in play that are limiting hay production. Tighter supplies of quality horse hay may be the new reality of the future. Horse owners need to become astute hay buyers, develop good business relationships with hay producers and dealers, learn how to manage large bales on their farm, and minimize hay storage and feeding losses. Hay production was extremely challenging in 2012, with low yields and tight forage inventories. Yields were frequently reported at 50 – 75% of normal. Other agronomic factors that significantly reduced yields included winterkill and spring frost damage, as well as insect damage from alfalfa weevil, white grubs, armyworm and potato leafhopper. Yields were much better in 2013, but wet weather during first-cut resulted in considerable amounts being either rain-damaged or mouldy as a result of being baled at too high a moisture. Following a long hard winter in 2014, spring inventories of quality horse hay are tight again as go begin the growing season. Economics determines the long term supply and price of hay. Hay will be available, but not necessarily at the prices we are used to paying. Historically, there have been surpluses of hay and a buyer’s market existed. This kept hay prices down to a level that was often below the farmer’s actual cost of production. However, economics have changed with the increased world demand and prices for crops such as corn, soybeans and wheat. Farmers have responded by growing less hay and more grain and oilseed crops. With declining beef cow numbers, the market for poorer quality cull hay has also declined. Corn and soybeans also have advantages over hay of more effective risk management from adverse weather, more hedging and marketing options, and assurance of payment by licenced elevators. Significant reductions in forage acres in Ontario occurred between the 2006 to 2011 Census years, of 500,000 acres of hay and 250,000 acres of pasture. That’s a lot of hay! Export demand for quality hay to the US is strong. Higher prices will be necessary for farmers to make the decision to grow more hay and increase acreage. The days of cheap hay sold at or below the true cost of production are likely over. Horse owners will need to deal with that new reality. Hay producers have bills to pay too. Hay prices are up, but the costs of producing hay, including fertilizer, land, machinery, buildings and labour, are also up. On a “cents per lb” of hay basis, the price of phosphorus and potassium fertility removed from the soil in hay is equivalent to about 1.5 – 2¢/lb. Land costs can range from 1¢/lb on land that rents for $60/acre and yields a 3 ton crop, up to 4¢/lb on land that rents for $320/acre for a 4 ton crop. Establishment costs (seeding, weed control, etc) are typically about 0.5¢/lb. Harvest costs (cutting, raking, baling, handling, etc) can add up to over 2.5¢/lb, while storage costs can add another 1¢/lb. Adding up these costs can bring the cost of production to over 7 – 10¢/lb of hay, before any return to risk, management and profit. Quality hay must sell at a premium to compensate for rain-damaged mouldy hay sold at a discounted price. Returns for producing hay must be similar to competing crops or else farmers will simply grow those other crops instead. The production of small square bales is decreasing and large square bales are increasing. For hay producers, not only is more labour required to handle small squares, but this system also has less production capacity. A lot less hay can be made in a day with a small square baler. This means less hay can be made during those limited weather windows with no rain in the forecast. Horse owners switching to large bales will need a tractor and loader to move bales, and possibly a feed cart to be used in the barn. However, this can provide more hay options as small square bales get more difficult to source. Large round bales are very common, but tend to be made to be fed on-farm or sold locally where they can be moved by tractor and wagon rather than a truck. They are usually less expensive and can work very well if fed outside in hay feeders. The use of large square balers is increasing because they increase production capacity, and also because large square bales are more dense and more easily transported than large round bales. For horse owners, large square bales also have the advantage over large rounds in that they can be “flaked” and more easily pulled apart if being fed inside. This is especially true if the balers are fitted with “pre-cutter knives”, where the hay is partially cut going into the baler chamber. In order to manage the risks of rain-damage, or mouldy hay from hay that must be baled before it is quite dry enough, many hay producers are using hay preservatives, such as commercially available buffered propionate products. 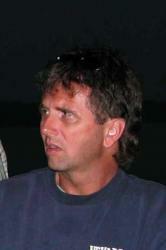 Refer to “Preventing Mouldy Hay Using Propionate Preservatives” (http://fieldcropnews.com/?p=3655). Hay preservative use tends to be greater in “rainy” years, and with large square bales. 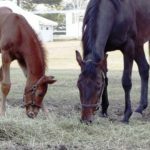 There is no scientific evidence that CFIA registered hay preservatives are harmful to horses, but the health risks from feeding mouldy, dusty hay is well documented. Horse owners that choose not to feed hay treated with a hay preservative will find untreated hay increasingly difficult to source. Hay prices often move with perceived supply and demand. They peaked at unprecedented highs during the dry summer of 2012. Prices for quality hay from the 2013 crop remained strong, but at the same time prices for poorer quality hay returned to lower, more traditional levels. Prices for this year’s hay will be dependent on yields and quality. Small square bales usually bring a premium price, whereas large round bales are discounted because they are more difficult to handle, store and transport. Hay prices are widely variable depending on quality, species, bale type, and location. The Ontario Forage Council (OFC) has a free Hay Listings website for those wanting to buy or sell hay. (www.ontariohaylistings.ca) As well, members of the OFC “Hay Marketing Forum”, an association of hay dealers, are listed at www.ontarioforagecouncil.com/hay-marketing-forum/members.html. Horse owners should seek to develop and maintain good business relationships with reliable hay producers and dealers that can provide a quality product. Making prompt payment is important. Bale size, density and weights vary significantly. If possible, price comparisons and hay purchases should be made on a “per lb” basis, rather than a price “per bale”. Learn what hay quality criteria are “deal breakers”, such as mould and dust, as opposed to factors that can be forgiven, such as sun bleaching on the outside of bales. It always amazes me that even with high hay prices I still see hay stored outside uncovered on the ground, and fed outside without hay feeders. Significant losses result. Inside hay storage is preferable, and pays for itself in the long term by reducing hay spoilage. Bottom bales exposed to a concrete or dirt floor will spoil from moisture. Storing bales on pallets or a layer of straw or other material will prevent this spoilage. As a minimum, bales stored outside should be placed on pallets and covered with a bale tarp. Unprotected bales will be damaged by rainfall, but also absorb moisture from the ground like a sponge, resulting in significant spoilage, mould and dust. Hay prices are quite variable depending on the weather and growing season, but underlying economic trends are pointing towards longer term tighter hay supplies and higher prices than what we are used to. Horse owners should become astute hay buyers and develop strategies for securing quality hay and reducing storage and feeding losses.